ON THE PODIUM: Millicent couple Noel and Pat Seebohm are proud of their sensational granddaughter Emily Seebohm, who won two gold medals for Australia at the Commonwealth Games on Tuesday night. WHILE many have had their eyes glued to television screens over the last week as Australia compete for Commonwealth Games glory in the Gold Coast, one local couple in particular have been screaming their support for an extra special person competing in the games. 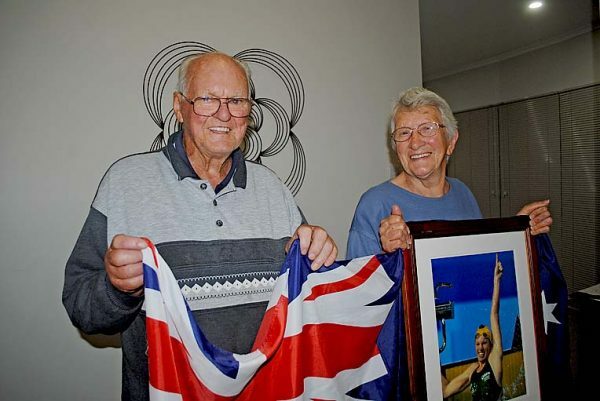 Although kilometres away from the action, the Millicent grandparents have been proudly waving the Australian flag in suppport of their granddaughter as she battles it out in the pool.